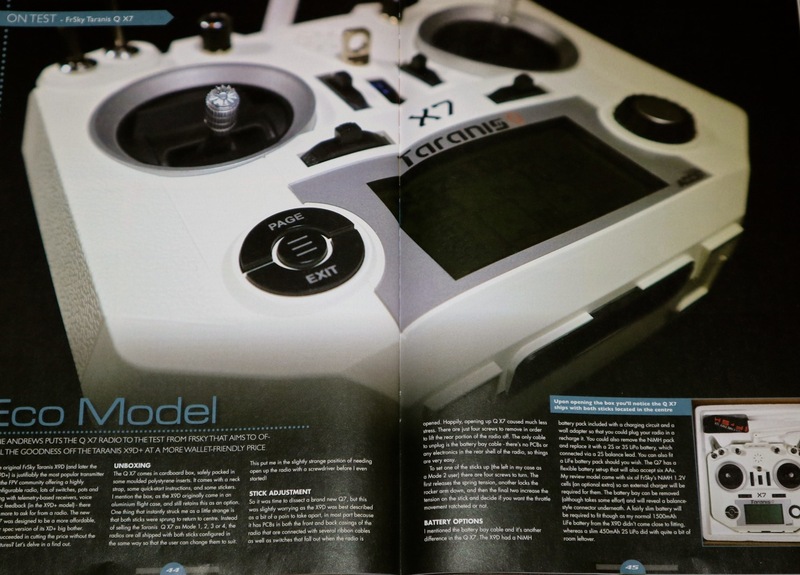 Not exactly topical is it a Taranis QX7 review, and even at the time of publication, it had been out a while. This review and another on the ImmersionRC Vortex 150 had a bit of a troubled journey into publication. RC Flight Camera Action asked me if I could do a review of the Q7 as they’d got it in from FrSky a “while ago” and FrSky were chasing them about the review. About 2 days after it arrived with me, the editor sent me an email saying that the magazine was having issues and it would be going to a quarterly release instead of bimonthly. I’d just written the review, when I got another email through telling me that the magazine would cease trading – but not to worry as the article could run in it’s sister magazine RC Model World, so I rejigged a few things to make reference of this radio for fixed wing flyers. I sent my words and pictures over, and it didn’t appear in the next issue of RC Model world, I thought I’d just missed the deadline, but then it didn’t appear in the next month either. I wrote some emails, they went unanswered and I found out elsewhere that the entire publishing group had gone under. 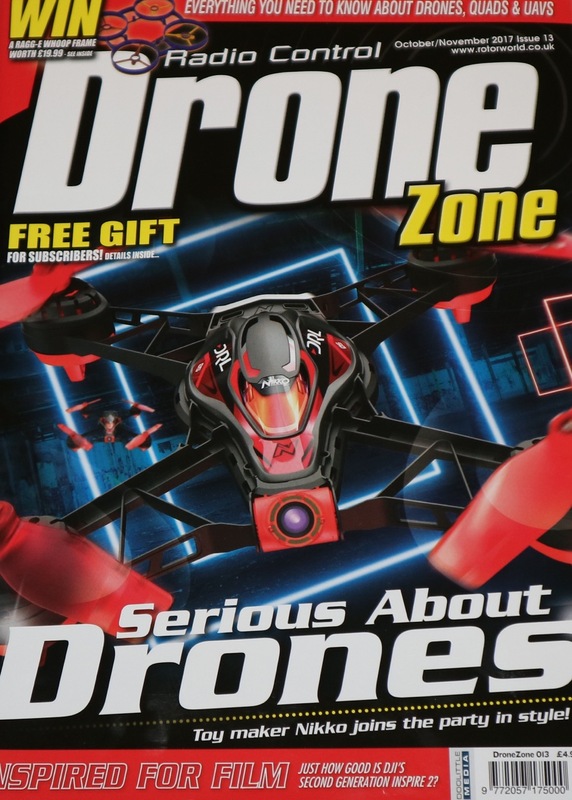 I talked to DroneZone magazine about the pieces I had ready, and they were happy to take these on and publish them, but they published bimonthly as well, so even after getting the radio the review took around 4 months to come out. But here it is anyway. If you want to look at a hardcopy, or digital version of the magazine, then you can check out their web site here. 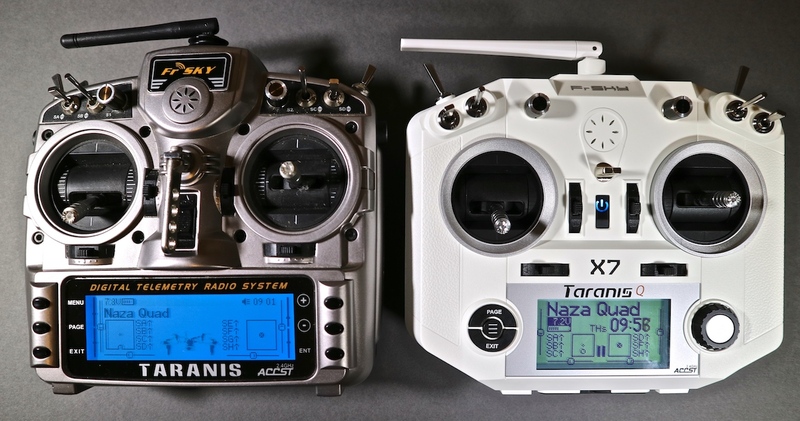 The original FrSky Taranis X9D (and later the X9D+) is justifiably the most popular transmitter in the FPV community. Offering a highly configurable radio, lots of switches, pots and sliders, along with telemetry based receivers, voice alerts, haptic feedback (in the X9D+ model). There wasn’t a lot more to ask for from a radio. 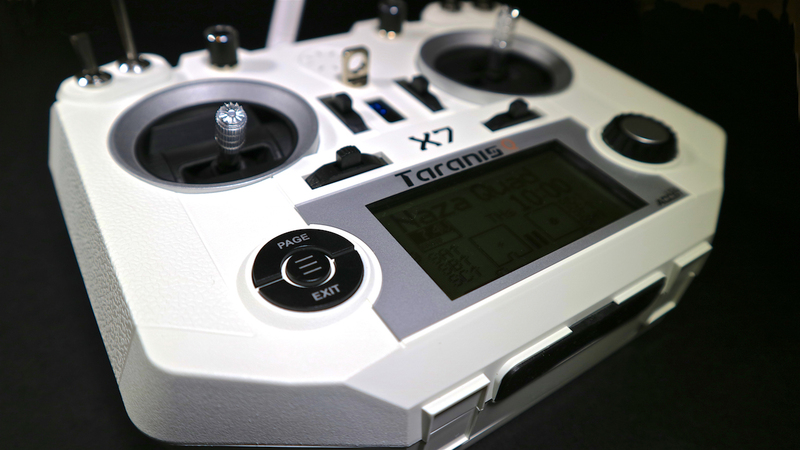 The new Taranis QX7 was designed to be a more affordable, slightly cut-down version of it’s XD+ big bother. Have FrSky succeeded in cutting the price without the important features ? Let’s delve in a find out. The QX7 comes in cardboard box, safely packed in some moulded polystyrene inserts. It comes with a neck-strap, some quick-start instructions, and some stickers. I mention the box, as the X9D originally came in an aluminium flight case, and still retains this as an option. One thing that instantly struck me as a little strange is that both sticks were sprung to return to centre. Instead of selling the radio as mode 1/2/3/4, the radios are all shipped with both sticks configured in the same way so that the user could change them to suit. This put me in the slightly strange position of needing open up the radio with a screwdriver before I even started ! This was slightly worrying as the X9D was best described as a bit of a pain to take apart. This was in most part because it has PCBs in both the front and back shell of the radio which are connected with several ribbon cables as well as switches which fall out when the radio is opened. Happily, opening up QX7 caused much less stress. There are 4 screws to remove in order to left the rear shell of the radio off. The only cable to unplug is the battery bay cable – there’s no PCB’s, or any electronics in the rear shell of the radio, so things are very easy. To set one of the sticks up (the left in my case as a mode 2 user) there are four screws to turn. The first to release the spring tension, another to lock the rocker arm down, and then the final 2 to increase the tension on the stick and decide if you want the throttle movement ratcheted or not. I mentioned the battery bay cable and it’s another difference in the Q7. The X9D had a Ni-MH battery pack included with a charging circuit and a wall adapter so that you could plug your radio in a recharge it. 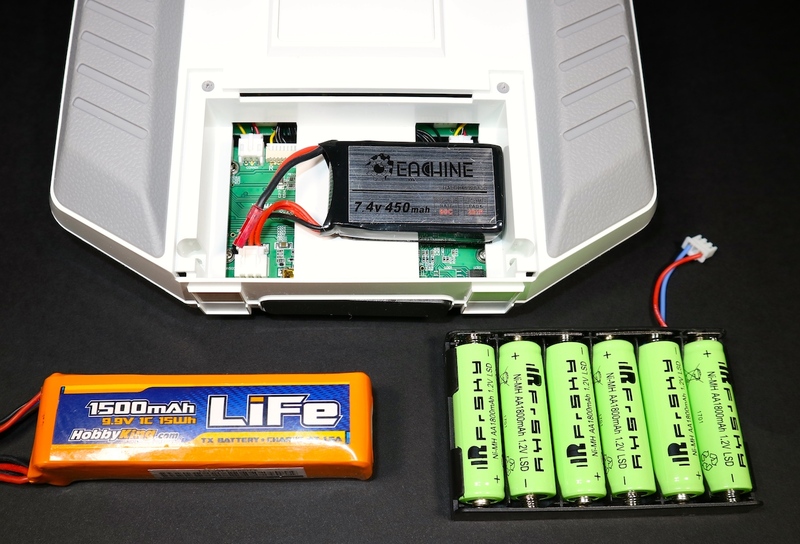 You could also remove the Ni-MH pack and replace it with a 2 or 3 cell lipo (of better a LiFE) battery which connected in via a 2s balance lead. The QX7 has a battery bay that will take 6 AA’s. My review model came with 6 FrSky Ni-MH 1.2v cells (this is an optional extra) but an external charger will be required for them. The battery bay can be removed (although takes some effort) and will reveal a balance style connector underneath. A fairly slim battery will be required to fit though, my normal 1500mah LiFe battery I use in my X9D didn’t come close to fitting, whereas a slim 450mah 2s lipo did… with quite a bit of room leftover. Turning the radio on with the SD card installed I was greeted with a cheery “Welcome to Open TX”. Instead of a normal switch, there’s a push-button under a membrane cover to press through which turns on the radio. This lights up in different colours depending on the circumstances. Green as it powers up, red to warn you of something, the throttle not being idle for example, and then blue for normal operations. There’s no chance of accidentally turning the radio off, as this button has to be held down for approximately 6 seconds to power off. The screen on the X7 is backlit, but is physically narrower and of a noticeably lower resolution than the X9D. So we lose the ability to show a graphic of the model we’ve selected, and some screens can look a bit cluttered if there’s a lot going on. The last cut-down portion of the X7 is the lack of two additional 3 position switches, and two sliders that the X9D has. But that leaves us still with four 3 position switches, one 2 position switch, a momentary switch, and two pots. The headphone and trainer port has been moved to the top of the radio, and the SD slot and USB connection are under a small flap on the base of the radio. The location of the USB connector here is a little annoying if you are using simulators on a computer as the USB lead sticking out from the bottom of the radio is easily knocked. A right angled USB connector might be useful in this event. 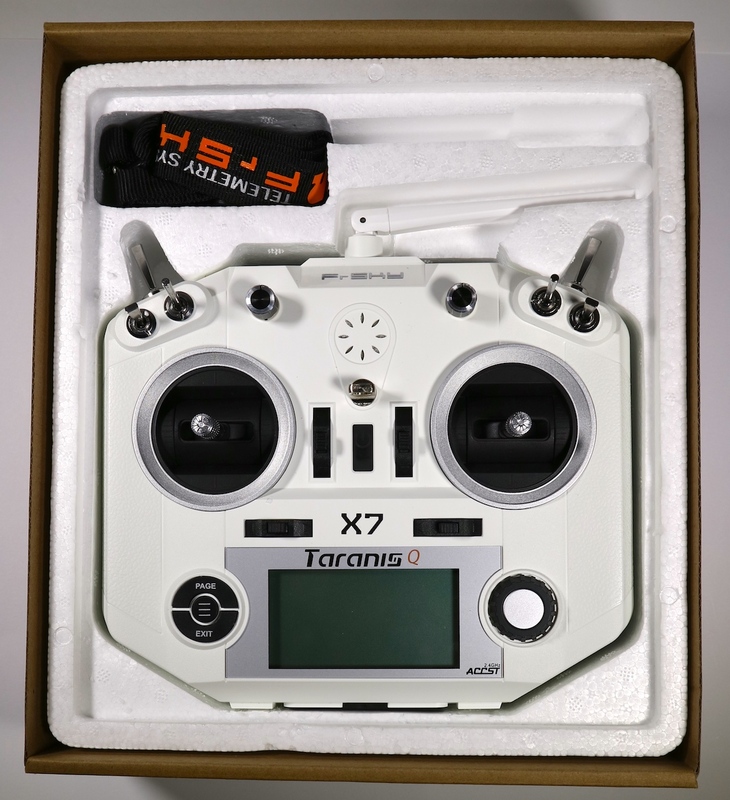 Now we’ve talked about the parts where FrSky have cut the original Taranis down to make the X7, lets talk about how it’s evolved it’s design for the better. Finally, holding the radio in my hands, it really felt quite different. A huge improvement that QX7 makes over the X9D is the use of a rotational scroll wheel instead of three buttons for up, down and enter. This makes an editing, and setup of your models a real breeze. 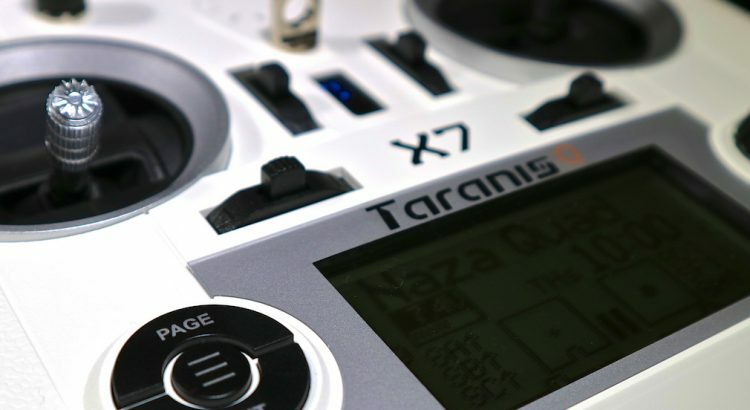 The “killer app” in the Taranis radios is the firmware that runs on them. This is OpenTX, an open source firmware for radios that is ultra-configurable, and is quite a jump if you are used to a radio from a traditional vendor. 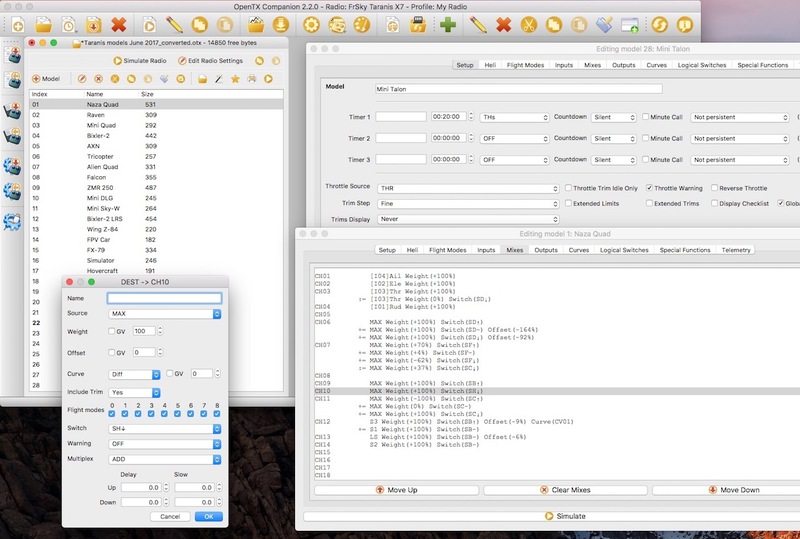 Essentially, with OpenTX, you can make any button, stick, or switch do anything. Gone are the days of having a switch for your rates, and another for throttle hold. Literally anything can perform any function. It’s more powerful than just assignable switches, you can also combine conditions to make logical switches, lets say we have 3 flight modes on our flight controller on a 3 way switch, but we could combine this with a 2 way switch in the form of “if switch 1 is active and switch 2 is at position x then this is logical switch 1” This logical switch can then be used in mixes, and other event trigger as if it was a physical switch. There’s a lot of possibilities available to you, and multiple ways of doing things, but if you are new to the radio and the firmware, the basics are easy to do. Quad racers using Betaflight will only have to create a new model and add a 5th channel for their mode switch and they are done – as so much of the tuning is handled via the flight controller. I wondered if that lack of the sliders on the side of the radio (as the X9D has) would be an issue if you were flying a camera-gimbal attached quad and wanted to pitch the camera straight down. You could of course move the control to a pot to produce very smooth motion, but it would mean letting go of one of the sticks. Alternatively you could program a slow and smooth gimbal pitch movement and assign it to a switch – so there’s ways around the few missing controls. Fixed wing flyers are going to be happy with the amount of customisation available. Taking a plane up for a maiden, then why not program in multiple different individual expo and dual rates, and make them unique to each control surface. Mixing in rudder and aileron, and then varying the amount of the mix in flight is all easily achieved. If one of the issue with having a highly customisable environment is forgetting what switch does what, then this is where the voice alerts can help you. You simply assign a voice prompt to a switch and the radio will call out what you’ve just switched on or off. This is especially useful if you are flying FPV and so are not physically looking at the radio. The voice pack you can download will cover most eventualities, but you can also record your own custom ones, and even play music tracks ! FrSky receivers are famed for their range and solid link. The QX7 can handle up to 16 channels – more than most models need. The majority of FrSky receivers have built in telemetry and so the X7 voice will alert you if the RSSI is dropping. Other telemetry sensors can be added to the receiver and this can also be sent back to the radio for display, or to act on in some way. If you don’t want to setup or edit your models on the radio itself, there’s a piece of software than runs on Windows, Mac or Linux called OpenTX companion. This will let you backup/restore models, edit them, upgrade your firmware or move models between radios. 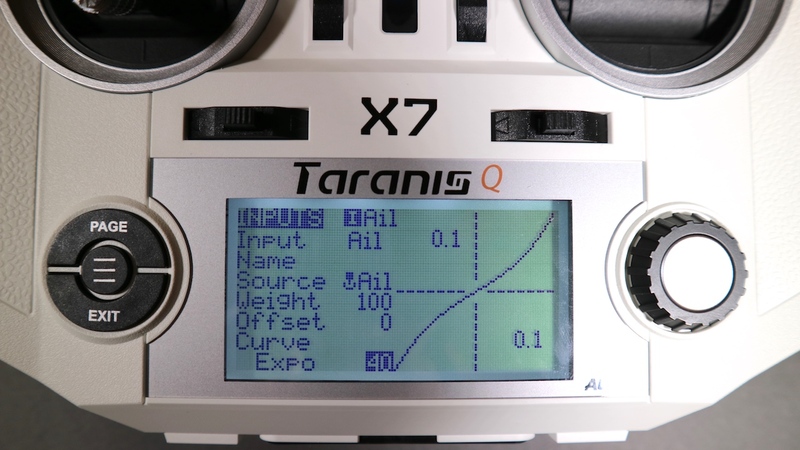 I tried saving the models I had setup on my Taranis X9D and saved them onto the QX7. It didn’t quite manage this without some intervention – as the software didn’t know what to do with mixes that used the sliders, or switches that weren’t available. A few minutes of editing the mixes within the OpenTX Companion sorted the problem out though. You can also run scripts in a programming language called LUA – if you aren’t a programmer, then don’t worry because lots of them have been written for you. Of interest to the 250 drone flyers might be the LUA script that gives the ability to view and edit their PIDs on their flight controller by connecting up the smart port on the receiver to a UART on the flight controller. I still scratching the surface – pretty much if you can think it, you can do it with OpenTX. I was also supplied one of the new tiny XM+ receivers. These have been very much developed with the drone racing community in mind. Measuring in at 21.5mm x 12mm x 3mm and weighing just 1.6g – sneeze and you’ll lose it ! 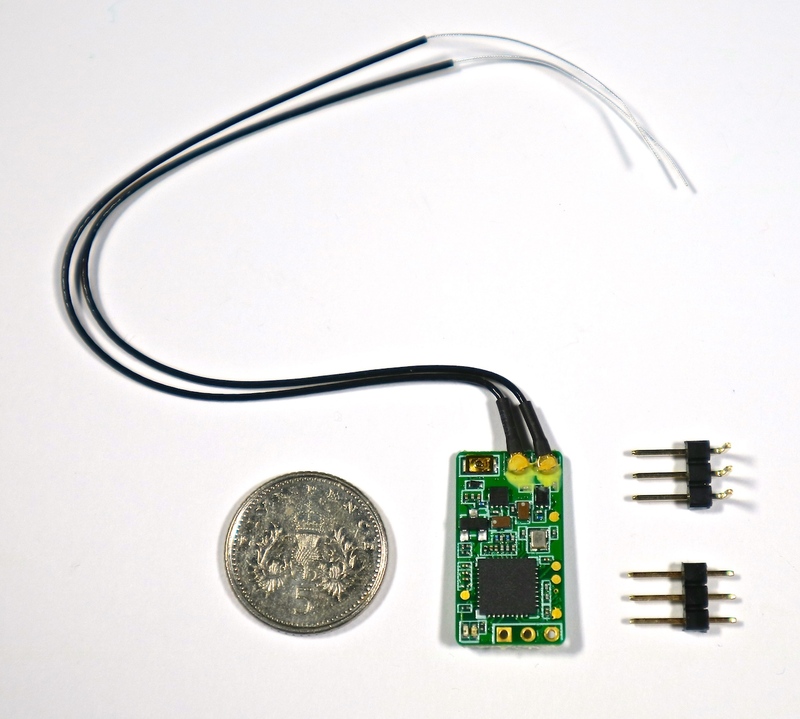 Too keep it this tiny, this receiver doesn’t feature telemetry and only supports SBUS. Pin headers are provided, but many racers will soldier directly between their flight controller and the receiver to save precious weight and space. It still supports 16 channels, has an RSSI pad to connect to, and it’s full range. Which in FrSky terms means they rate is at greater than 1.5kms. If you ever need to update the firmware on the receivers (FrSky often bring out enhanced firmware or add new features) then you can flash the new firmware via the X7. This is done via the pins in the module bay in the back of the radio, and aside from flashing receivers, you can of course add other TX modules which use the popular JR size and fitting. So want to run Spectrum, or ezUHF, then just slot one in the back. 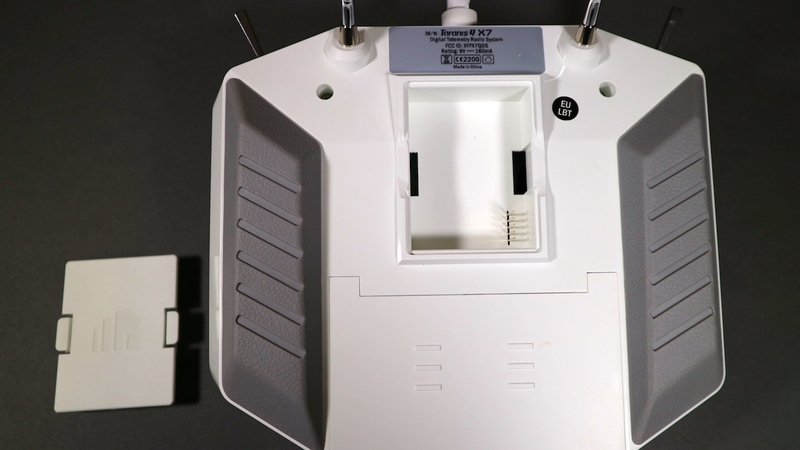 Each model can choose to use the internal 2.4Ghz transmitter, or an external one – so there’s no need to keep removing a module if you don’t intend to fly a model which uses it. I installed the XM+ in an MXP230, and bound it up to the radio. As it already had my copied over model settings from the X9D, all I had to do is bind it and fly it. 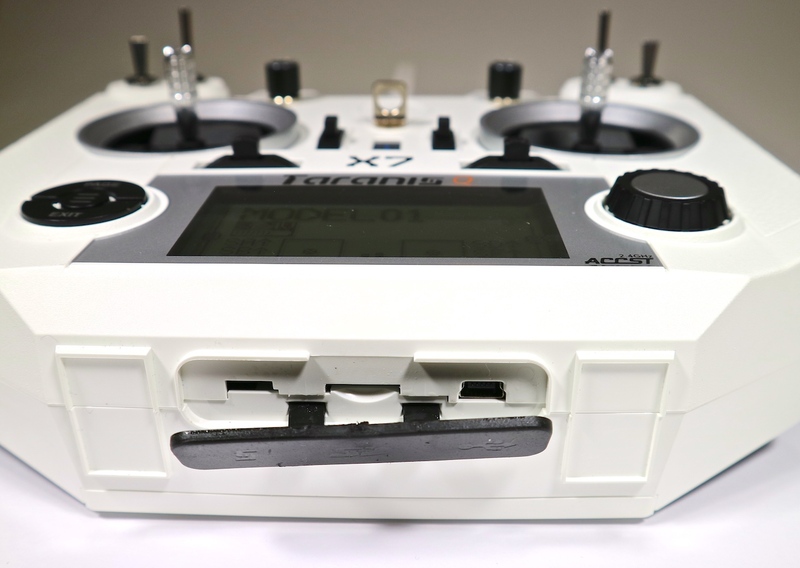 The QX7 has the same internal XJT TX module as the X9D and so in flight, the range and link quality were identical. A few grams saved over the normal FrSky X4R-SB receiver. These XM+’s are small enough to go in micro models as well – I have one in a brushed 1s based 80mm quad, and with the popularity of the brushless micro quads, this rx is a great match. Although, as mentioned, whilst this isn’t a telemetry receiver, it does have RSSI pads available on the receiver, but I found a nicer solution was to use some enhanced firmware FrSky released in combination with a flight controller with an integrated OSD (an Omnibus F3 board in my case). The new firmware changes the SBUS stream from regular 16 channels, to 15 regular channels, with channel 16 reserved for RSSI. All that was needed were a few changes in the Betaflight configurator to show the RSSI value on the OSD as I flew – giving me greater confidence about my radio signal. 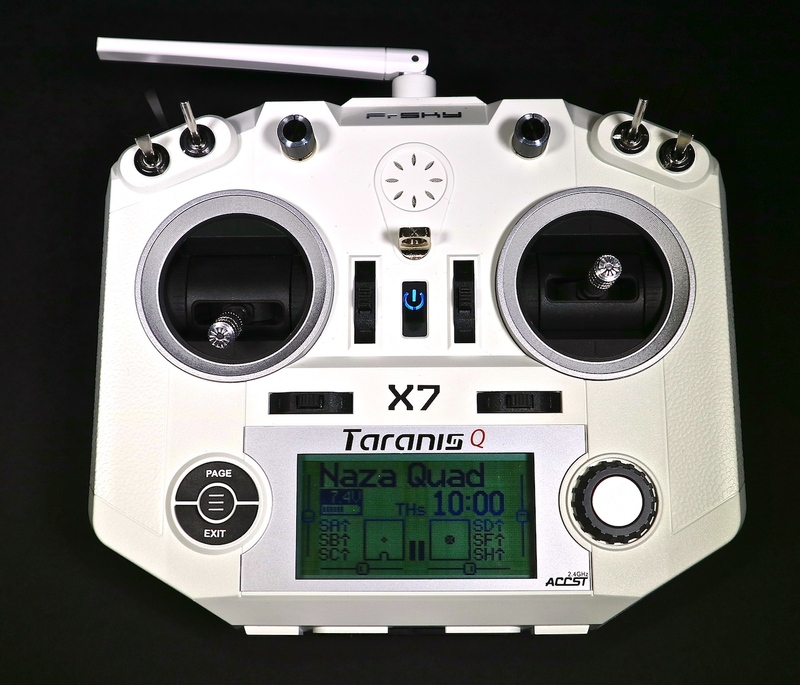 So, should you buy a Taranis X7. In short yes, if you are just coming into the hobby, it’s a fantastic radio full of too many features to list, and is amazing value for the price. The only thing I miss that the X9D had is the sliders. I used these for pan and tilt on some of my FPV planes, and it’s very convenient to pan over the wing as you execute a turn without having to move your thumbs off the sticks. This missing feature is, for me at least, the only negative I could really think of, but it’s outweighed by the number of improvements over the X9D: The scroll wheel, the better ergonomic grips, a cleaner sound from the speaker. In short, it’s a great radio that will excel in flying most setups.